The vehicle we bought is a 1996 Land Rover Defender 300tdi 90 (Van) in metallic epsom green with 86,000 miles on the clock. I wanted a van as it reduces the security risk, the 300tdi engine is also considered by many to be the best engine Land Rover ever produced. With only 86000 on the clock this is the perfect base vehicle for me to upgrade, modify and own for a long long time. 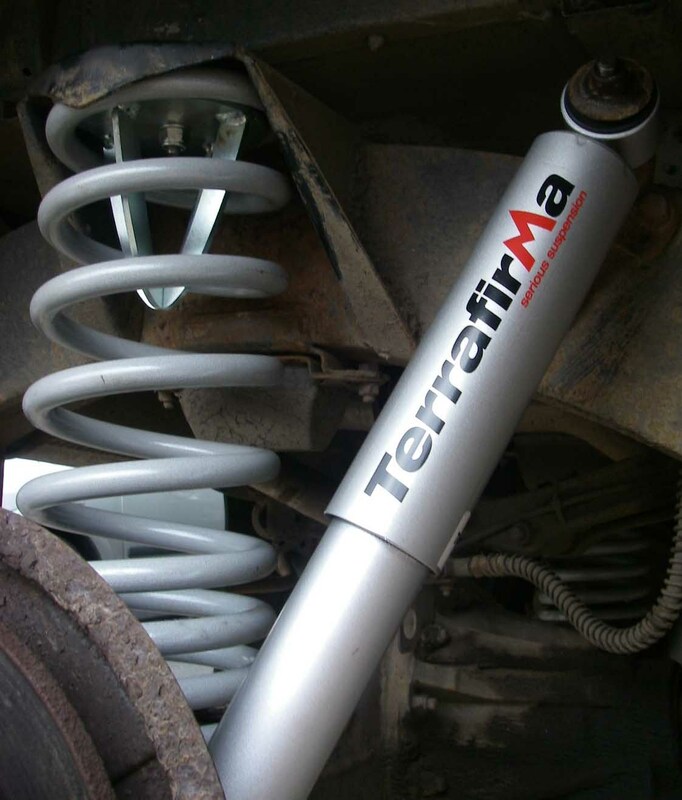 The primary components I wanted to sort out on the 90 included a snorkel, 2 inch suspension lift with medium/heavy duty springs (Terrafirma) and larger tyres. – The snorkel or raised air intake allows the engine to breath at a higher level than standard. primarily designed to prevent the engine drawing in water whilst crossing rivers or during floods these are also usefull for drawing cleaner/cooler air in dusty/desert environments. – Wheels. I went for OME military wolf steel wheels as these are strong and will take huge loads (rated at 2200kg). Note that alloys carrying heavy loads offroad or indeed an impact offroad could crack the rim resulting in a loss of seal and deflating tyres. If you manage to bend a steel wheel… Just knock it back into shape. I kitted the rims out with what i consider the best mud terrian avaiable. The BF Goodrich MT KM2. Specifically the 255/85r16 as this is tall (33″) and reasonably narrow (10.75″). 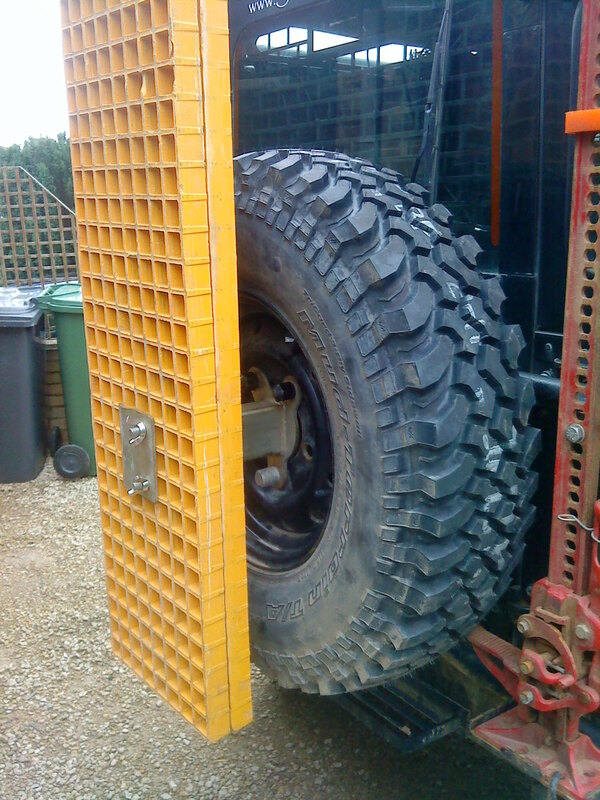 The height gives a greater clearance under the axles to avoid grounding out, rock damage etc. Some may argue that an MT tyre is not needed for overland travel. This choice was made because we regularly green lane as a solo vehicle in the UK. For overland travel it also depends on which road you will travel. I would rather stick with an MT and go prepared. These are also fitted to the trailer. – To accomadate the tyres i needed to lift the bodywork slightly to aid articulation under certain conditions so a 2″ lift kit (Terrafirma) was fitted. To go with this is also opted for heavy weight springs (220 front 340 rear) which will sit nice with the additional loads of the equipment that will be present on the vehicle. We have since replaced the TF shocks with Old Man Emu N44s on the rear. HD turrets (D44) were fitted up front and dislocation cones (D44) were fitted to the rear. At this point i also removed both front and rear anti-roll bars. – Up front we have an ARB winch bumper equiped with a Warn M8000 winch upgraded with a 5.6hp goodwinch bowmotor, albright sealed solenoid pack and Bowrope synthetic line. All electrical cables are uprated to 35mm square. A cut off switch and wander lead plug have been installed. In addition to this i have also wired an in-cab switch to allow easy control of the winch line whilst driving out. A pair of PIAA 120w driving pattern lights (80XT) also hang from the bumper. – In addition to these we have, overtime, added Tree slider sills, fuel tank guards, QT differential guards, Scorpion Racing rear wheel carrier, Whitbred Offroad roll cage and the TD5 rear fuel tank which also required the side exit exhaust. – Through the summer and for Morocco an extended breather kit was not deemed neccesary, but now that we are back in the UK in the winter months I have fitted the extended breathers. – After a particulary muddy greenlane run back in December (08), I decided it was time to mount the waffle boards on the outside of the vehicle to prevent mud geting everywhere inside. There are limitless places you can put these, but the best solution i have come up with is to use an Equipe 4×4 Hi-Lift jack holder and modify it to take the waffles. These will then be stored by the spare wheel with the weight taken by the carrier. Ideal. The Idea was to keep the original battery on its original circuit with original fusebox and to not mess with it if at all possible. All additional accessories added would be via a 2nd Battery on a split charge system and an additional fusebox in place for equipment. The advantage of this system over, say, running 2 batteries in parallel is that, should my installed equipment fail, short, run for too long and drain my 2nd battery, the vehicle will still start up and run as normal from the original batt/set-up. This is a must when travelling as a solo vehicle in remote regions as you cannot afford to have flat batteries in the morning. The split charge will deal with topping up the original battery 1st, then when fully charge will swap over to charge the 2nd battery and hopefully keeping them both in excellent condition. The second battery, split charge and compressor have all been squeezed into the existing battery box under the passenger seat. The additional fuse box has been bolted to the bulkhead behind the passenger seat. 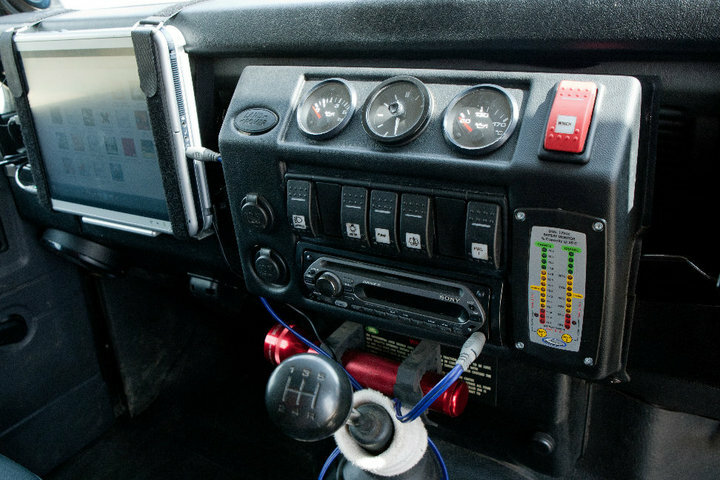 The dash area has also been updated with the use of a Mudstuff Console which now houses the stereo headunit, 2 12v sockets and a switch bank (winch, air compressor, wash/wipe, work light, driving lights, fuel transfer etc). Along with the switches i have recently added a National Luna Dual battery monitor. This is simply a series of LED’s showing the state of both batteries. the upper section has 3 additional gauges, these are oil temperature, oil pressure and the original clock. If using the carling switches, i recommend the connector blocks because taking the dash out and removing 4-6 wires per switch is a PITA. This was of course an after thought and something i have had to go back and (time consumingly) rectify. 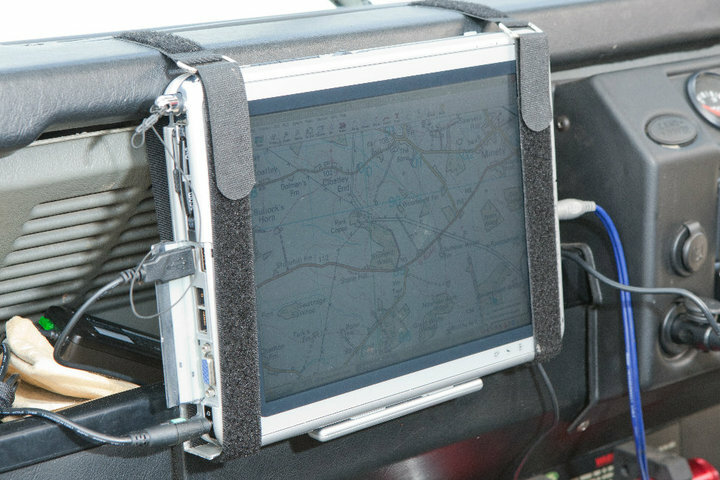 Navigation was carried out using a Dell x51v PDA for both Morocco and the Alps along with numerous greenlanes in the UK. Whilst it worked well, the screen did prove a little on the small size due to notbeing familiar with surrounding areas whilst abroad. With this in mind we have purchased a tablet/slate laptop (HP TC1100) which has a 10.4″ digitizer touchscreen and foldaway keyboard. It also has a 40GB hardrive which means we can store all the mapping on one unit. With this system we are able to store/edit photos, write trip reports/diaries, play music/movies, keep cost spreadsheets, update the website etc etc. It is a far more stable and versitile platform for overland navigation. We are still using the Garmin 10 GPS unit via Bluetooth along with Memory Map, Fugawi and Mapsource software. To aid traction with regards to towing the trailer I have upgraded the open axle differentials (both front and rear) with Detroit/Eaton Truetrac limited slip (LSD) units. 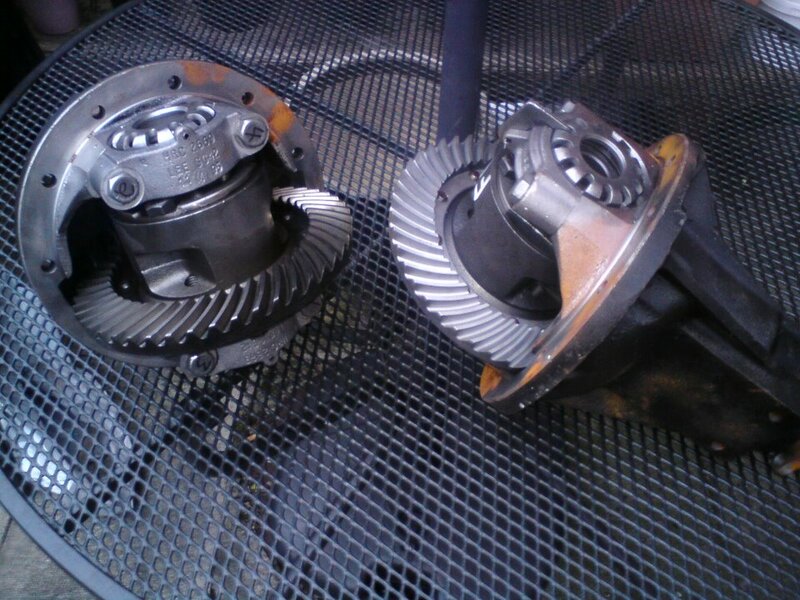 These have no wearing parts and are renowned for their reliability and longevity in use. More information can be found here. Whilst most enthusiasts argue that a switchable locker is better, these cannot and do not prove reliable in use without further upgrade to transmission components/parts and carrying spares for the system. I also feel that an overland vehicle does not require the complexities of 100% locking differentials. Since Morocco and the Alps we have invested in a pair of hannibal awnings for both the side and rear of the vehicle. The side awning has the 3 sides with it to form a room. The rear awning is attached to a small ARB deluxe roof rack. This occupies the square section of the roof before the roll cage slopes down to the windscreen. Fabulous site enjoyed looking at it and reading of your adventures, my wife and I are somewhere in Australia doing a round Oz trip, terribly lost at the moment but that’s how we like it and am enjoying every bit of it we only get reception when near a major town or city so maybe sometime before we make contact again guys. In the meantime be safe and travel well. We saw your impressive Defender in Queenscliff today, and we left a note on your windscreen…..a very impressive Defender…We saw a guy in a new Jeep pull over & have a really good look. Hope you enjoyed Queenscliff. Whats with the 6 months til the first day of the rest of our lives?